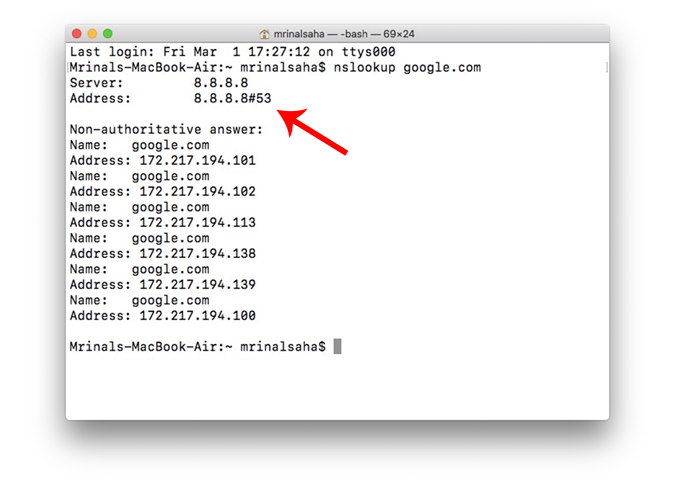 How to Find Out What DNS Server Am I Using? You have set up a new DNS server on your machine and you have no clue whether it’s working or not. Well, there are ways to check it. 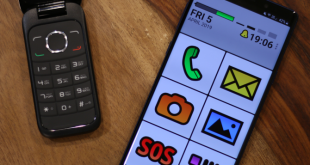 You can do it natively through the command line or with the help of third-party apps. But before that, it’s important to understand how DNS works. When you search a thing on the browser, your search requests go through multiple DNS servers before landing on the website. So there is no way for you to check local DNS server on an online website. But thankfully, you can find your current DNS server with just a few clicks. All you have to do is run a simple command or use a free app. Before we get started, let’s clear some confusion about DNS servers. Assume a typical home network where a router is used to connect to the Internet. You connect all the devices like your laptop, PC, smartphone, and media streaming devices to it. Now, as I said earlier, by default, you would be using the DNS server provided by your ISP. But some people do change their DNS servers to something like Google Public DNS for better speed, OpenDNS to block adult content on the network, or Smart DNS Proxy if you want to unblock geo-restrictions. 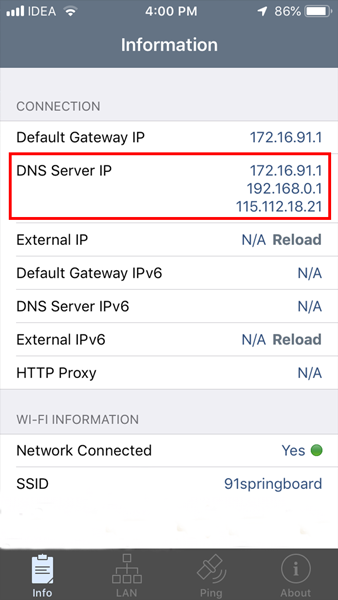 Now here is the thing, if you change the DNS server on the router (let’s say Smart DNS Proxy), then every device connected to the router will automatically start using Smart DNS Proxy as the DNS Server. However, on top of that, if you change the DNS server on your local computer to let’s say Google Public DNS, then these settings will override the DNS settings of the router. Now, only your computer will use Google Public DNS as the DNS server while the rest of the devices will still use Smart DNS Proxy. If you’ve configured a custom DNS address on your system, that DNS will be used. Next, If you have not entered any custom DNS on your device, then the device will use the DNS address available on the router. If you have not entered any custom DNS on your router, then every device will use the DNS provided by your ISP, which is like 90% of the time. Below is a complete guide to setting up a DNS Server or you can also watch a quick video (link at the end of the post). There are multiple ways to check the DNS Server you are using on Windows. Here is a couple of them. To check the DNS Server you are using on Windows, simply open up the command prompt. To do so on Windows 10, click on Start, then All Programs, then Accessories, and finally on Command prompt. and run the following command. ipconfig /all | findstr "DNS\ Servers"
In case you are wondering, all that the command does is pulls all the network configuration values and then filters out the “DNS Servers” line from it. The second method is much simpler and has a user-friendly command. That is, simply do a nslookup of any web address and Windows will show what DNS server you are using as part of the lookup. To do a nslookup, simply use the below command. You can replace “google.com” with any web address you want. In fact, you can even replace it with your own IP address. To check what DNS Server you are using on Linux, simply open up the terminal and do nslookup for any website. Just type in the following command. You can replace “google.com” with your own IP address as well. In case you are wondering, “nslookup” is a command line utility that resolves the DNS name to an IP address, thus revealing the DNS server used in the process. Similarly, on macOS, open the terminal and type the following command. To launch the terminal on macOS, press CMD + SPACE to launch Spotlight, and then type in ‘terminal’. and hit enter. Alternatively, you can open your Applications folder, then open Utilities and double-click on Terminal. Once the terminal windows open, copy paste following command and hit enter. There are a handful of Android network scanner apps on the market that let you see what DNS you are using. I would suggest Network Info II. The app is free, light-weight with no ads. Simply download it from play store, open it and go to the WiFi tab. There you’ll see DNS 1 and DNS 2 entries. These are the DNS servers you are using. Alternatively, you can also try the PingTools Network Utilities. It has some of the best and useful tools. You also get additional utilities that can perform tasks like UPnP scanning, LAN wakeup, port scanning, etc. To know the DNS address, install the app from Play Store and open it. Now, tap on the “Router” or “Internet” icon and it will display all the network details. Here, you can find what DNS you are using by looking at DNS 1 and DNS 2 entries. By default, your router uses the DNS Server provided by your ISP, but if you suspect someone has changed it on your router, here is how to find it. Simply open up the web browser, and type in router’s IP address (usually 192.168.1.1 or192.168.0.1) and log in with username and password. Most of the routers have credentials return behind it. Once you see the router’s web interface, depending on the router model look for DNS 1 and DNS 2 entries. Usually, it’s under the Network Setup or Status option. In case you find any third-party DNS IP here, try googling or do a nslookup with the IP to find out the server associated to it. If you are still unsure about the DNS service, then it is advisable to change the DNS on your local computer. This will override the setting on your Router and now you can peacefully enjoy browsing the web. So, these were some of the ways to find out what DNS Server you are using. Depending on the operating system you have, choose the most efficient way. If you are experiencing any DNS related issue such as DNS Server not responding, you can either clear your DNS cache or check out our this article for the in-depth solution. In case of any other queries or difficulties, let me know in the comments below.